They may be small in size, but the islands that make up the Dry Tortugas provide a real wealth of bird watching opportunities. Those in the know have reported that it's truly not unusual to see 70 or more different species of birds on the islands in the spring. The island chain is part of the Great Florida Birding Trail. The Dry Tortugas is a popular resting spot for birds migrating between South and North America. Notepad and pencil/pen for jotting down what you see. (You can also check off the birds on a bird watching checklist: see above). 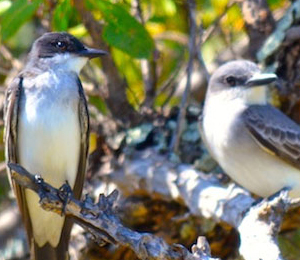 You might want to take a look at the checklist to see what types of birds are commonly seen in the Dry Tortugas and then bring a field guide so that you'll be able to look up a bird you see to learn its name. Binoculars. While not absolutely necessary, having a good pair of field binoculars will go a long way to helping get an up close and personal look at these magnificent and beautiful creatures. Lightweight and waterproof clothing. It's humid in the Dry Tortugas and also very sunny. You'll want to be dressed appropriately. Sunblock. Sunblock. Sunblock. We'll say it again: sunblock! A hat. Not a cap (baseball style). A hat with a wide brim to block the sun's rays from your face and eyes. Water. You may not be near a water fountain or snack bar and you'll probably get thirsty. Bring some bottled water along with you.